The methods of summer hunting for high mountain black bears provides a non frequented method of hunting these berry munching bruins with equal opportunity for success. 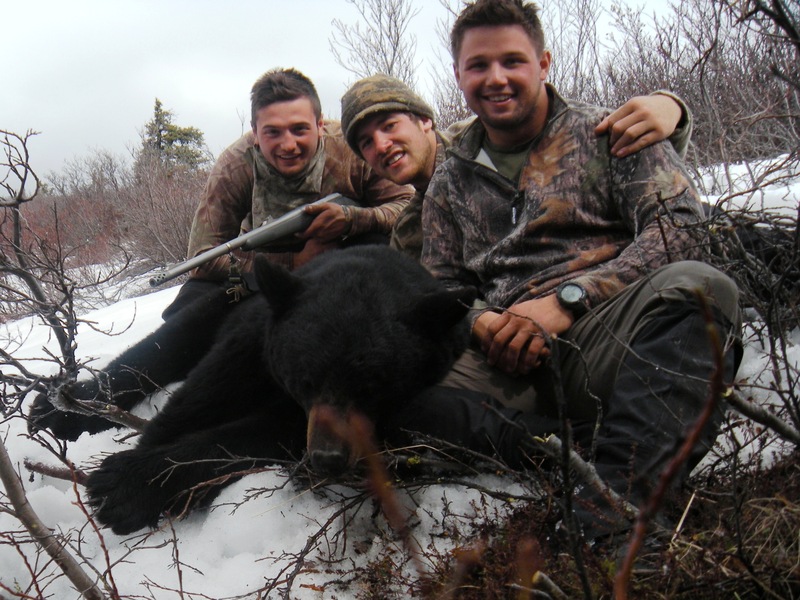 Usually when hunters think of black bear hunting, bear baiting over stands, hunting with hounds, coastal spot and stock, are several methods that come to mind. This article will outline how to target black bears above the alpine tree level in during mid to late summer. Focusing on areas in the Kenai peninsula, several access points in which to cast off for a shot at a public land non-guided hunt for the budget conscious hunter, will be provided. Also included is tactics used, cautionary advice, a potential gear list, and methods of transportation to and from the areas. During mid to late summer, black bears will travel above tree line to forage on red, black, and blue berries to gain nutrients needed to last through the winter. There exist a popular opinion of not hunting these summer bears due to lack of quality of hide from rubs, summer coat, etc. After several successful high mountain mid summer hunts, each of the bears taken had a full beautiful non-rubbed coat. 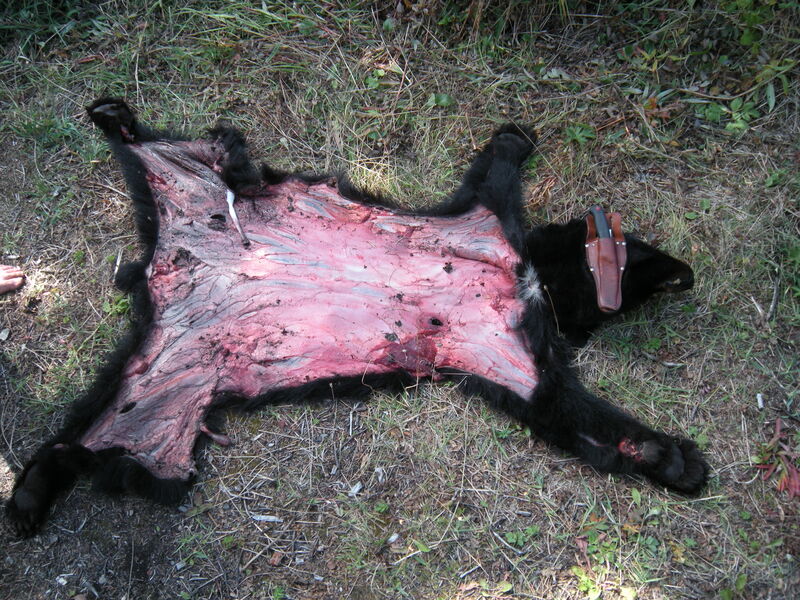 This could be due to the fact that the bears have a fluid breeze above the trees that shield them from insects, and immense heat, the root cause of rubs and hide quality. For optimal success you must go to where the bears are located, which is at the top of the mountains. Literally you must be higher than the bear, hunting from high above the tree line focusing directly above the spruce alpine level. The most important tool for this mid summer tactic and most important tactic in general for Alaska is optics. Using quality binoculars in the 10×42 range will increase your chances for success greatly. The time spent glassing is less time spent walking, let your eyes do the walking for you. Tags can be purchased over the counter in Alaska at Fred Meyer, Carrs Grocery, Sportsmen Warehouse, Walmart, etc. The cost of the non-resident license is (85$) black tag cost (225$). This hunt can be done without a guide and involves an adventurous hunter that wishes to test his hunting skills, mentally, and physically the limits of his spirit. The separating factor that will allow an avid hunter to stay the duration of the hunt is simply determination and gear quality. You pay for what you get and I would recommend you find Barneys sports Chaley before departure for any last minute items needed. -Spotting Scope (20×40-60) and tripod. -Water proof sealable bag to enclose all gear within pack and prevent gear from getting bloody as your hunt will be success ful with proper diligence. -Clothes:Pack in layers. 1 Goretex or similar rain jacket. 1 fleece jacket. 1 pull over half zip. 1-2 long johns(I recommend 1 set underarmor). I Polyproalene, or spandex/nylon/polyester/lycra mix long sleeve. 1x Mamut champ pants orlycra spandex mix (dry as you walk and in wind). 1 under armor t-shirt base layer. 2-3x Marino wool socks. All clothes depend upon length of hunt. This list will generally get you through 1 week of hell and back…minimum. All clothes will dry just slip of your rain jacket and sleep in your sleep bag with wet under layers and socks, trust me they will dry. NO COTTON, ahah don’t kid yourself. -1 poncho to cover pack and items at night. -Bivy Sack(Gore-Sleeve cover for sleeping bag) Hence no tent needed. Or light weight tent. Depending upon number of hunters. (RECOMMEND 2 men sniper team) tent poles only mean extra weight=more weight to all= less distance to cover=less animals. Places to go- .The Alaska Department of Fish and game owns many small airplanes, and “own much of the sky”. Do not think for a second you will be able to not follow the rules, and play exactly by those rules. State Troopers and Game Wardens will keep a close eye on you (usually) from start to finish on a hunt. They have even been known to land there “super cubs” “piper” single engine airplanes on your spike camp just to check your licenses and tags. That being said, there is literally endless country in Alaska in which monster berry munchers can be taken, however for purpose of this templated hunt I personally would stick to the Kenai Peninsula. There are many trails you can venture from simply parking the rental car and venturing out. Upon arrival in Alaska or prior to Arrival in Alaska, researching the harvest numbers of the black bears in the particular game management unit would be a great idea. 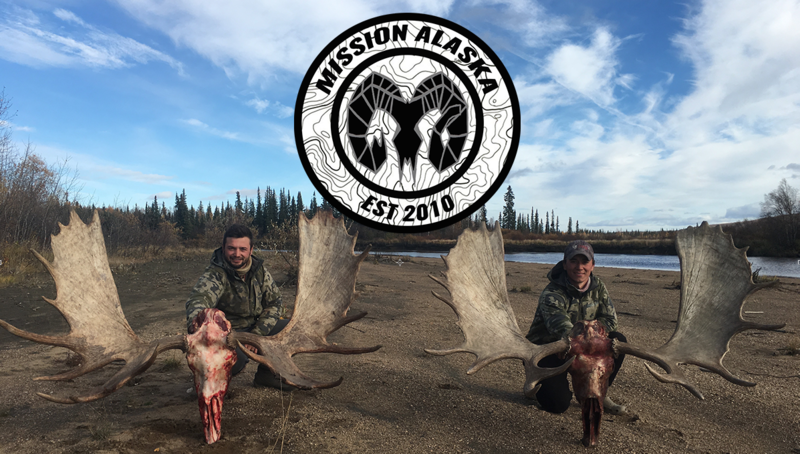 The wildlife biologist at the Alaska Department of Fish and game would be more than happy to speak with you about these harvest numbers and the success ratio of the area you wish to hunt. The biologist would like feedback from what you saw once returning from the hunt as this helps the biologist to control the area. . Hunting the major highways from the road can also prove successful, you must be willing to drive and “spot” (glass mountain sides) at likely rest areas. Following the Alaska highway During May and spotting either sides of the mountains may provide success as well. Several trail heads, in the . The true key to successful hunting in Alaska without a guide is the location. One of the most crucial tools to have before the hunt is the ever so popular, Alaskan Gazeteer. This is a popular topographic map book of the entire state, outlining hiking trails, atv trails, and other avenues to put your feet in endless country. You can find this book on the internet with a simple Google search, however upon arrival in the AK you can find the book at Barnes and Noble near the Anchorage Sportsmens Warehouse. This book should be studied religiously before the hunt to orient yourself with the mile markers, lakes, rivers, creeks, etc. In order to hunt this summer bears you must literally act like one of them. The best chances for success is to hike to the top of a mountain and sit and wait, you must let the bears come to you. The less walking the better, you will see bears on far off mountains and your best bet is not to chase them as they will eventually find you. There has been countless times when I have been glassing or even napping when a black bear has fed within 70 yards directly below me, and of course meeting his demise. 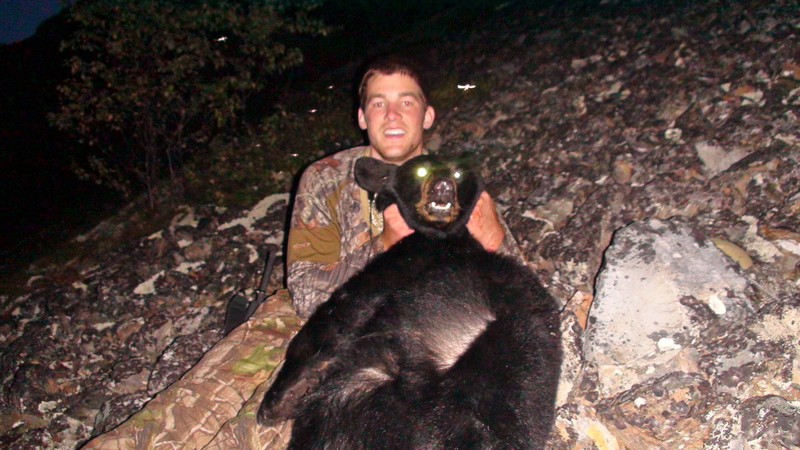 There are several advantages to hunting these black bears from the top of the mountain versus hunting them from the bottom of the mountain. Alaska is called the bush for a reason, the lower mountain valleys is very difficult to traverse. Once you hike above the “bush” or alders willows and spruces, the terrain becomes very open and “easy walking”. Easy in the sense that you do not have to deal with criss-crossing snags and bushes that literally grab ahold of your feet. The tundra becomes your trail and is your own manifest destiny to the summit of the mountains. The reason you hike to the top of the mountain and look down versus hunting from the ground up is purely time advantage. It is much easier and quitter to decend upon your prey than it is fight the “bush” and acend on your pray. Hunting from the ground up is difficult because it will take you hours to get up to the bears location. Hunting down will increase your chances by a significant margin as after spotting the bear the task becomes a time game. They appear and disappear in minutes so you must move quickly. Chances are if you are hunting from the ground you will lose the prey as you fight to ascend, which is not only a physical battle but a time battle. Really enjoyed the short descriptive blog. I am heading out to Alaska and plan on hunting out of Hope and the Resurrection Pass Trail. I like the idea of getting above the bears, but one of my other thoughts was to have someone air taxi me back away from the main trails. Do you have any idea how much these typically run and would it even be worth exploring? Thanks for all the great information. Plane flights can be pretty expensive, however they can get you to areas with little to no hunting pressure. Plane rides will run you between 1000-4000$ depending upon the flights. Public hiking trails you will often run into many hikers, other hunters, and state troopers. Public land in Alaska is abundant and if you work hard enough you will find the game animal your searching for. One tip for black bears through the fall is to keep your eyes/ binoculars above the tree line, focusing on the blue berry choked tundra between 2000-7000 thousand feet of elevation. My favorite technique is to hunt these fall black bears like I would for dall sheep. Hike to the peak of a mountain and let my eyes do the walking for me. I apologize; I forgot to give the dates we are heading out there. It will be early September.